Dreaming: Emu, honey-ant, bush potato, Mt Wedge, sit down. Evelyn has painted the countryside which surrounds Central Mount Wedge, to the south of Mount Allan Station. 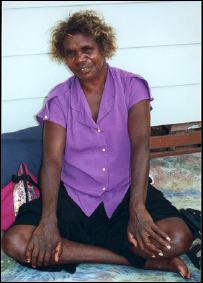 The Warlpiri and Anmatyerre people know this region as Kerrinyerra, while it is known as Mount Wedge Station by the white settlers. Kerrinyerra is the home of many Dreaming stories, including snake, owl, goanna, and rain and lightning stories. 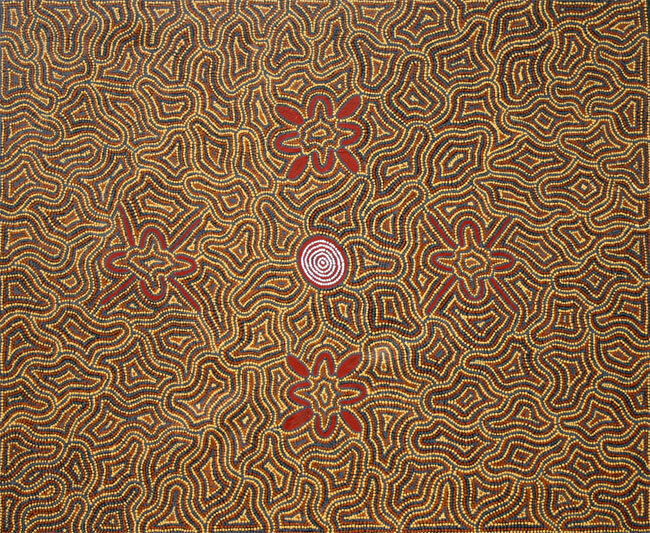 This work represents the Dreaming of Evelyn's mother, and is concerned with the bush plum. Groups of women (U shapes) are shown sitting around in groups, some with digging sticks, and some with the oval shaped coolamons (wooden food bowls) as they share the food, sing the songs of the country, and talk about the hunt.